I love complicated cookbooks with extensive ingredients that can only be sourced from specialty markets in Thailand and the dark back allies of Barcelona. They make great coffee table books, but really, who cooks likes this? Welcome Lorena Garcia’s New Latin Classics: Fresh Ideas for Favorite Dishes. Chef Lorena offers approachable recipes that won’t break the bank or the pantry. A key theme of her book is repurposing ingredients; meaning you won’t have bottles of exotic oils and jars of foreign spices lingering in your kitchen from that one time you used them last year. Waste not, want not. Chef Lorena’s Indispensable Despensa is a great go-to guide for ingredients you’ll need to cook with Latin flavor and flair. Comfort food will never go out of style, but Chef Lorena shows us that with a simple tweak favorite dishes can be reborn. With that she gives 100+ recipes that will revive your love for simple, authentic Latin cuisine, and surprise the international foodie in you. Using fresh, vibrant ingredients, Chef Lorena’s’ recipes burst forth from the glossy pages with inspiring and exciting flair (to say nothing of ease) that will leave your taste buds in a daze. The cookbook is laid out like a menu. So you can check out the Basic Recipes chapter for foods like rice, beans, salsa and infusing your own oils to the Cocina Casera: Homestyle Favorites like huevos pericos and nuevo arroz con pollo. My personal favorite is the chapter titled 30 Minutos: Delicious Food on the Fly. This is a great chapter for those of us who want all the flavors of low & slow cooking but who do not have time for complicated meals. This book has simple techniques, easily sourced ingredients, suave tips from the chef and uncomplicated recipes. The book’s introduction asks, “What’s the secret to great Latin-inspired food? Create layers of flavor that unfold with every bite.” That’s exactly what Chef Lorena Garcia does with her new book on Latin classics. In the spirit of a full pansa, LatinoFoodie will be giving away a copy of Chef Lorena Garcia’s new book that was graciously provided to us by the renowned chef. If you’d like to enter to win Lorena Garcia’s New Latin Classics: Fresh Ideas for Favorite Dishes please post a comment telling us one of your favorite Latin-inspired dishes. Think pasta, chicken, or a new twist on a side dish or dessert. Deadline for the giveaway is Thursday, November 3. Who knows, we may be featuring some of your inspirations on this blog! For more information about Chef Lorena and her efforts with Big Chef Little Chef to combat childhood obesity, please follow the link to her website. Whipping this soup in the blender adds body and makes the naturally creamy butternut squah puree even lighter. For an extra hit of coconut flavor, add ½ cup shaved unsweetened coconut to the blender along with the soup (strain the soup after pureeing fora super smooth texture). 1-15-Ounce can of Coconut Milk. Place the butternut squash on the prepared baking sheet, season with the salt and paper, and toss with 1 tablespoon of the olive oil. Roast until lightly caramelized and a paring knife easily slides into a piece of squash, about 1 hour. Remove the squash from the oven and set aside to cool. Melt the butter with the remaining 1 tablespoon of olive oil, in a large pot over medium-high heat. Add the onions, carrots, celery, leeks, lemongrass, zucchini, bay leaves, and roasted squash and cook, stirring often, until the vegetables soften and turn golden brown around the edges, 8-10 minutes. Pour in the white wine and bring to a boil, stirring and scraping up any browned bits from the bottom of the pot. Once the wine is mostly evaporated, pour in the chicken stock and bring it to a boil. Reduce the heat to medium-low and cook until all the vegetables are soft, 10 – 12 minutes. Turn off the heat and discard the lemongrass and the bay leaves. Set the soup aside to cool for 20 minutes. the coconut milk and puree the mixture until it’s completely smooth. Transfer the soup to a clean pot. Repeat with the remaining vegetables and broth, and coconut milk. Bring the soup back to a simmer over high heat, reduce the heat to medium-low, and simmer for 5 minutes. Turn off the heat. 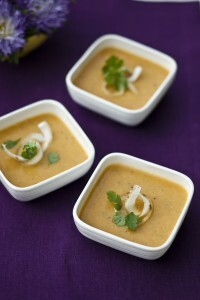 Divide the soup among eight bowls and serve sprinked with cilantro and toasted coconut (if using). Group, a division of Random House, Inc. All rights reserved.